In the second-pettiest looming controversy of this postseason, Houston had been accused by both the Indians and Red Sox of having a man working for the Astros standing in the camera well, using a cell phone camera to capture images of their dugouts. MLB has come out swiftly and strongly on the matter: It doesn’t care. 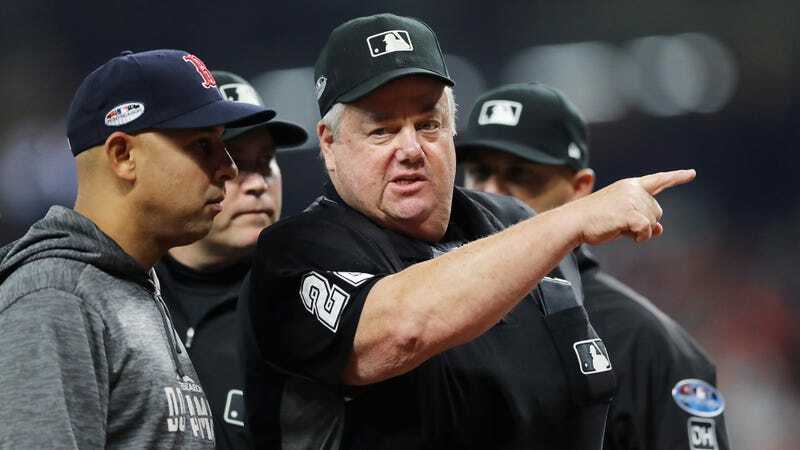 “Before the postseason began, a number of Clubs called the Commissioner’s Office about sign stealing and the inappropriate use of video equipment. The concerns expressed related to a number of Clubs, not any one specific Club. In response to these calls, the Commissioner’s Office reinforced the existing rules with all playoff Clubs and undertook proactive measures, including instituting a new prohibition on the use of certain in-stadium cameras, increasing the presence of operations and security personnel from Major League Baseball at all Postseason games and instituting a program of monitoring Club video rooms. Maybe this is true! I don’t know. I just find it funny that it’s exactly the same defense offered up by Chris Correa, the Cardinals analyst who hacked into the Astros’ internal database. Correa claimed he did it to make sure the Astros hadn’t been stealing proprietary info; he was sentenced to 46 months in federal prison. I find it hard to get all that worked up about sign-stealing, where the line between what’s gamesmanship and what’s illegal (a runner on second base? Fine! A guy in center field? Affront to the sport) often kind of arbitrary. So I’m pretty okay with MLB declaring this not a big deal. It’s certainly better than MLB’s usual tactic of making every ultra-miniscandal as huge a deal as possible. Regardless, I do enjoy drama, and I enjoy teams disliking each other, and I enjoy the Astros’ heel turn. So this is an ideal outcome, because a lack of MLB action does not by any stretch mean an end to the beef. At the start of this blog I called this the second-pettiest controversy of the playoffs. I think it’s high time we get to the pettiest. Bring on the pine tar war!